IF YOU HAVE A JOB & A NICKEL, YOU COULD BE RIDING TODAY! Hey it's Tracy Myers from Frank Myers Automax and I'm in a pickle. The Doctor told me me to calm down so my heart doesn't explode. The only way for me to calm down is to help you get a nicer, newer car. So I'm making it easy by having a Nickel Pickle Sale! Right Now, you can put just 5 cents down and could be approved for a nicer, newer vehicle! Even if you've had some past credit problems! Even if you've been turned down before! - WELL QUALIFIED CONSUMERS CAN DRIVE HOME IN A NICER, NEWER CERTIFIED VEHICLE FOR AS LOW AS A NICKEL DOWN! 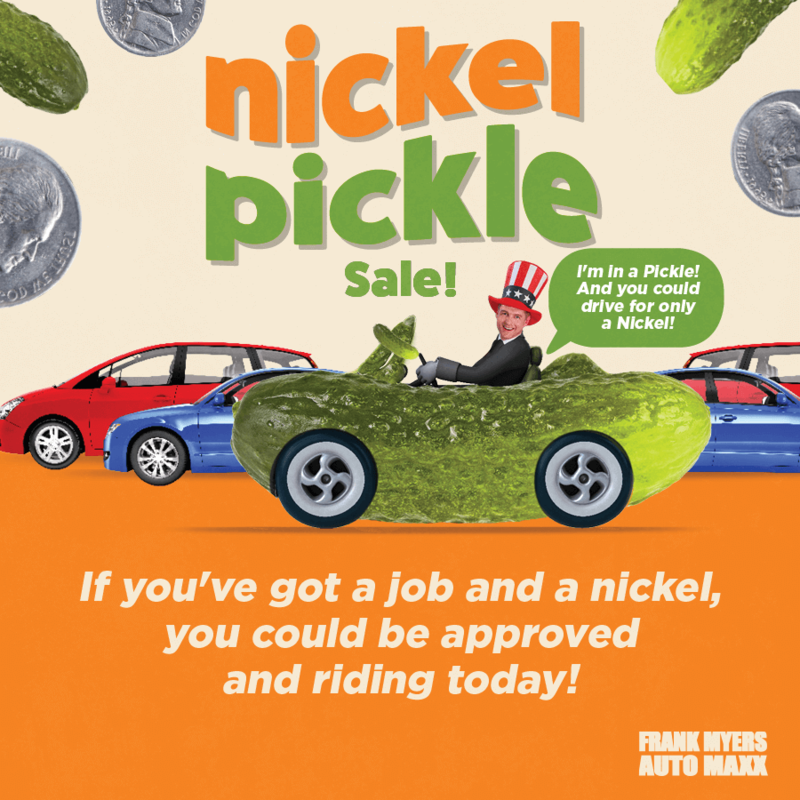 - THIS IS A PRIVATELY FUNDED PROGRAM THAT HELPS CONSUMERS GET A GREAT DEAL ON A NICER, NEWER CERTIFIED VEHICLE FROM FRANK MYERS AUTO MAXX. THE PROGRAM IS DESIGNED TO ENERGIZE THE ECONOMY, BOOST AUTO SALES AND PUT SAFER VEHICLES ON NORTH CAROLINA ROADWAYS. NO LOCAL, STATE OR FEDERAL TAX DOLLARS ARE BEING USED TO FUND THIS PROGRAM. - CREDIT ISSUES? FIRST TIME BUYER? DON’T WORRY! OUR “EVERYBODY RIDES” PROGRAM HAS OPTIONS AVAILABLE FOR YOU! - NORMAL CREDIT QUALIFICATION REQUIREMENTS HAVE BEEN REDUCED. - WE APOLOGIZE IN ADVANCE BUT THIS SPECIAL OFFER MAY NOT BE COMBINED WITH ANY OTHER OFFER OR PRICE DISCOUNT. - HURRY! THIS OPPORTUNITY ENDS ON SATURDAY AT 5PM OR ONCE THE FUNDING RUNS OUT FOR THIS PROGRAM...WHICHEVER COMES FIRST!